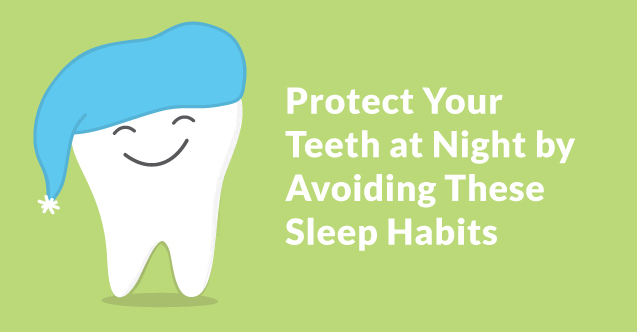 Certain sleeping habits we keep can severely damage our pearly whites. Make sure you avoid these sleeping habits that can damage your oral health. Those midnight snacks or bedtime munches end up leaving harmful bacteria in your mouth throughout the night. When we sleep, our saliva production decreases. While this helps us have a restful sleep, it also means that bacteria and sugar can’t be properly washed away. When we eat before bed, sugars and bacteria are left on our teeth allowing tooth decay to occur throughout the night. It is best to avoid the midnight snacking and to brush your teeth before you settle in for the night. 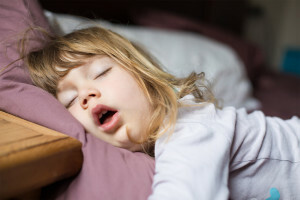 While it’s common to breathe through your mouth at night when you have a cold or stuffy nose, nightly mouth breathing can be damaging to your oral health. A constant stream of dry air in your mouth can result in dry mouth. Dry mouth has the same effect of snacking late at night; not enough saliva is produced when you sleep with your mouth open, which helps wash away harmful bacteria. You are encouraging tooth decay when you sleep with your mouth open and are more prone to cavities. For some individuals, sleeping is a time for grinding teeth. According to Sleep Bruxism in Respiratory Medicine Practice, an average of 3 percent of adults grind their teeth while sleeping. Sleeping helps our body and mind recover from the day’s work and boosts the healing qualities of your immune system. Boosts to your immune system are not only good for your body but for your oral health as well. A proper night’s sleep can help you fight off oral infections and diseases that can affect your mouth such as gingivitis and periodontal disease. Get a proper and restful sleep each night to keep your teeth and gums healthy. The National Sleep Foundation suggests adults get an average of seven to nine hours of sleep each night. A stressful night can cause you to take your worries out on your own body while you’re sleeping. Going to sleep while tense can result in grinding and clenching. Stress can also alter your physical body, leading to a change in hormones and blood pressure. Stress has been linked to an increase in inflammation in the body, which can result in an increase in oral inflammation and diseases. Long-term stress is best avoided for the sake of your oral health. When it comes to a good night’s rest, avoid these sleep habits that can damage teeth for your best sleep. Your dentist and your smile will thank you for a restful night’s sleep.